The new 23-by-9-foot LED video "wall" allows fans on the lawn of the Gerald R. Ford Amphitheater a close-up view of Robert Plant & The Sensational Space Shifters on Tuesday, June 19. 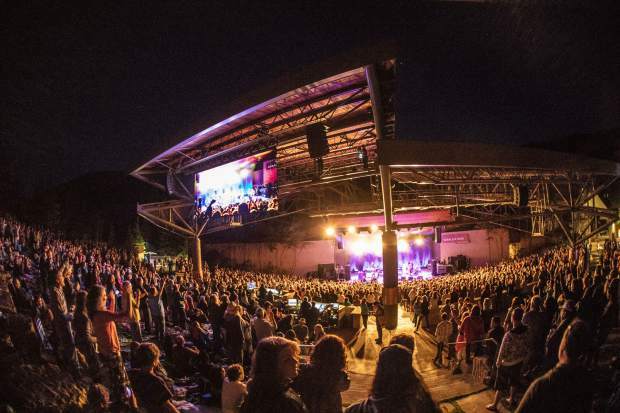 VAIL — If you’ve attended a concert at the Gerald R. Ford Amphitheater in Vail this summer, then you’ve likely noticed the latest addition to the venue: a massive LED video screen that was installed in May. Despite its size — the company that made it, Creative Technology, calls it a “wall,” rather than a screen — its location in the rafters at the rear of the pavilion means it enhances, rather than obstructs, views of the stage from the lawn. Joe Kania, lead video tech for the amphitheater, said performers have been intrigued by the tech team placing cameras around the stage to capture the action, but the biggest positive response has come from spectators. For the GoPro Mountain Games earlier in June, Kania’s team recorded two shows with strictly GoPro cameras at the sponsor’s request but since then has been using professional-grade cameras, allowing more control over the video-capture process, leading to a highly polished finished product. Displayed on the 23-by-9-foot video wall, those larger-than-life close-ups help each person on the lawn feel a closer connection to the performer, Kania said, enhancing the overall energy of the venue. “It’s not the kind of thing, sitting on a lawn, you would ever expect to see with your own eyes,” Kania said.